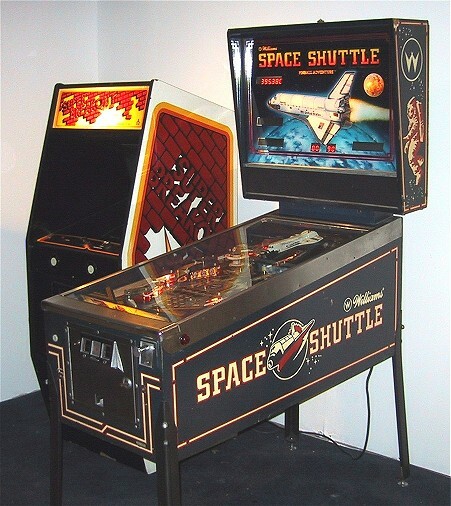 Space Shuttle was manufactured by Williams in 1984. A total of 7,620 games were produced. The game was designed by Barry Oursler. Space Shuttle was one of only three System 9 games released by Williams, the other two being Comet and Sorcerer. 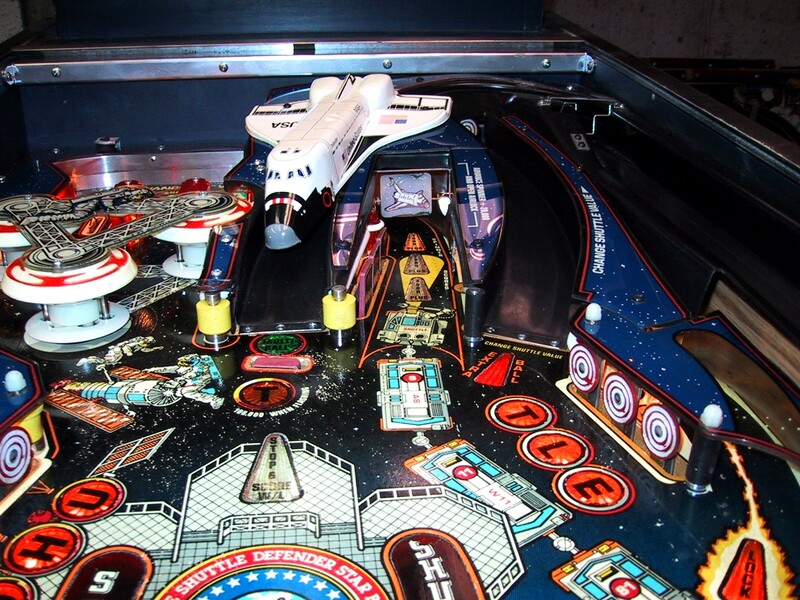 Fun fact: Space Shuttle was the first Williams game to feature a "toy" on the playfield. 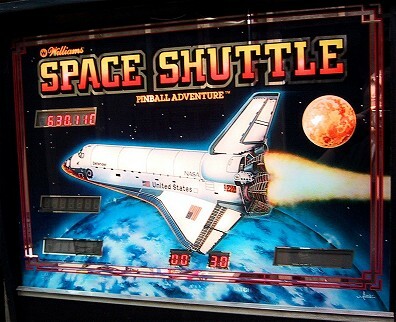 I obtained my Space Shuttle from an arcade in Sea Isle City, New Jersey in the spring of 2001. A fellow that I had purchased my Masquerade (Gottleib, 1966) from had just retired and purchased a 50% interest in an arcade at the Jersey Shore (now thats how to retire!). If you've been to the Jersey shore lately, you'll notice that in the towns that allow them, redemption games have taken over most of the arcades. Kind of like little casinos dispensing stuffed animals. Sea Isle City is one of them, and "traditional" skill games like pinball, and even video games, are in the minority. When the seller and his partner bought this arcade, they had one pinball machine, Space Shuttle. He was getting rid of it because (his quote, not mine), "its not a dot matrix game and I don't like any other type." Never mind that I think Space Shuttle could still earn if maintained (the theme still holds true today). His short sightedness was my gain. The game worked perfectly, but was extremely dirty. It looked like it had been about 5 years since somebody last cleaned the game. 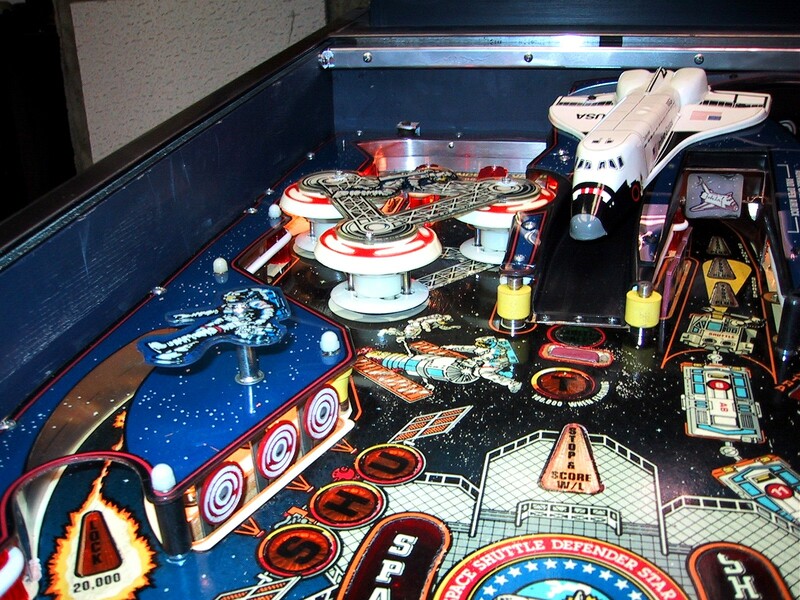 However, the playfield was Mylared! We struck a deal and all I had to do was move it a block down the boardwalk and then down the ramp to my van! The game made it back to the gameroom in fine shape and played perfectly from day one. The Mylar was extremely dirty and I made the decision to remove it as part of the shopping process. The game received a complete shopping, almost to the restoration level. Everything was removed down to the bare wood. 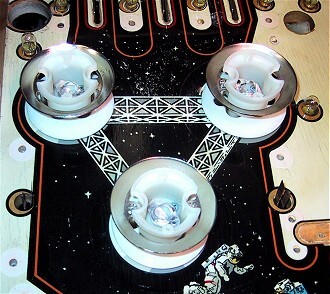 I did leave the ball trough mechanism on however, as I would only be waxing the playfield, not getting it clear coated. For Home Use only machines, I think if you put on enough coats of wax (at least four) and keep your machine clean, the surface will last at least as long as you do! 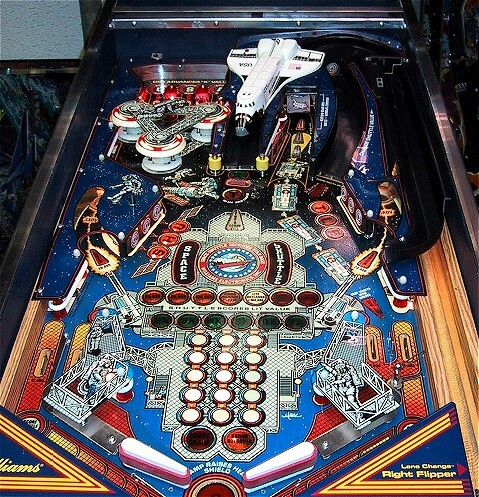 The playfield of the machine had been saved because early in its life an operator had applied Mylar to the playfield before any significant wear started to appear. There was already some minor wear around the inserts, which most likely prompted the Mylar application. 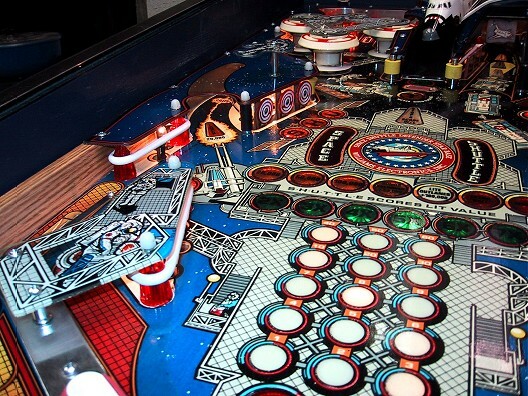 The Mylar was stripped off of the playfield, not a fun job! 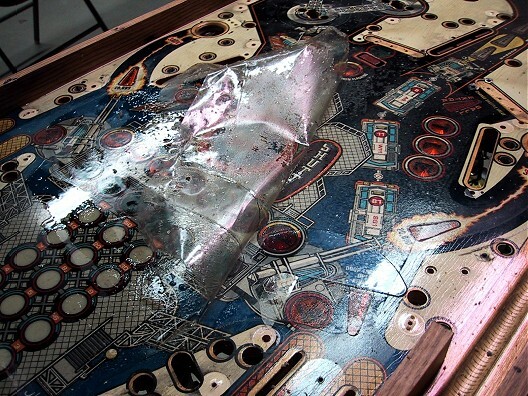 You can read more about the fine art of playfield Mylar removal on my Mylar Removal Page. 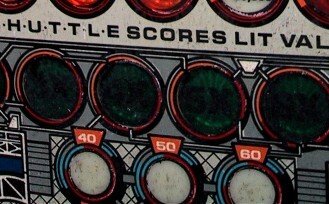 There were several applications of Mylar on the playfield, having been added at various points in the machine's past. 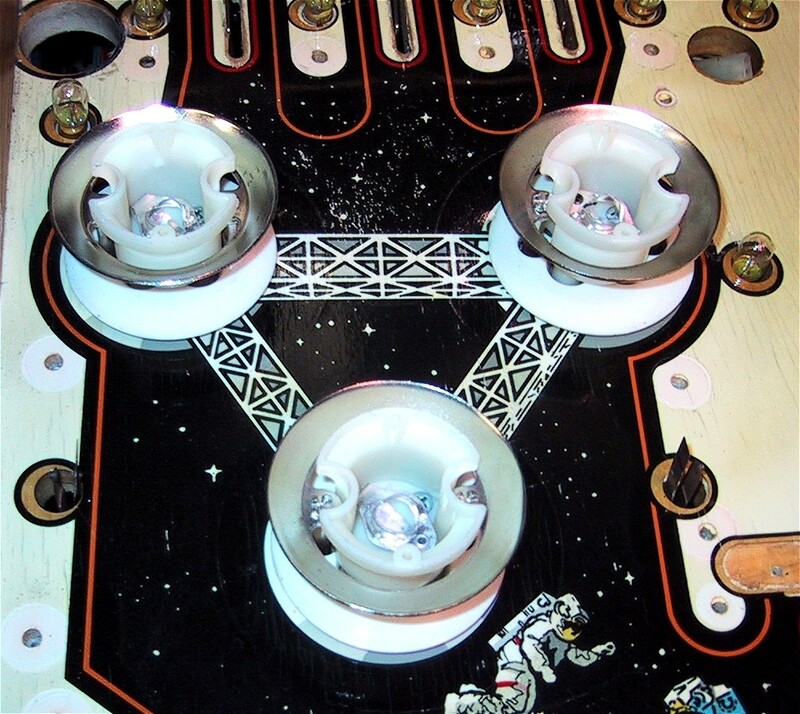 I removed three layers of Mylar at the point where the ramp drops the ball back onto the playfield! 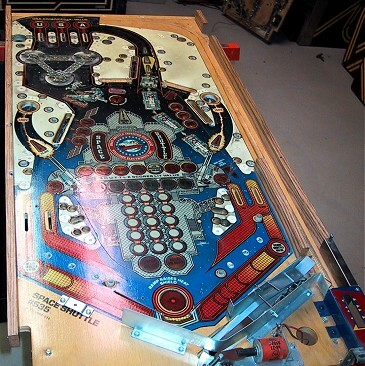 The Mylar was removed with Goo-Gone, a cleaning solvent that dissolves the glue holding the Mylar onto the playfield. dumped into my tumbler for a couple of days to clean it up. 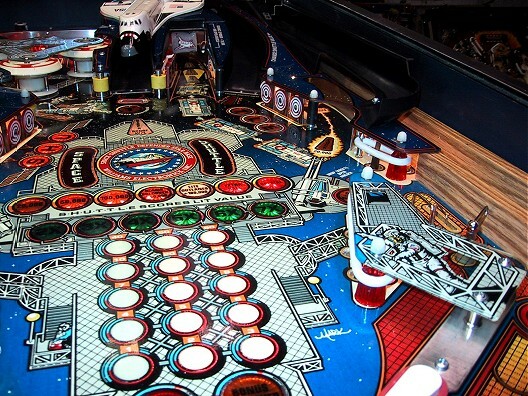 Note - Before taking one post off of the playfield, I took about 30 photos of the playfield from every angle possible. 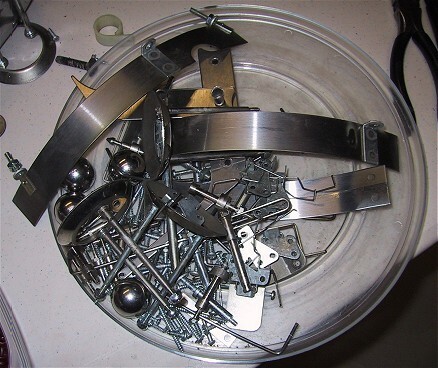 Unless you have a spare fully populated playfield to use as a reference, you will not be able to put it all back together again! All of the posts were put into the dishwasher and came out looking like new. I was lucky enough to have been able to find a set of NOS Drop Target decals for the game. 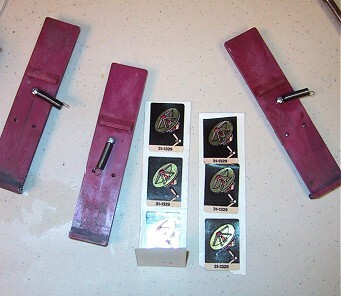 As you can tell from the photo on the right, the single Drop Target (at the base of the ramp), had seen plenty of use! After the Mylar was removed, the playfield was given 4 coats of wax and then reassembled. All lamp sockets were removed and cleaned, and all bulbs were replaced with new #47 bulbs. The pop bumper assemblies were rebuilt, with all new parts, including new lamp sockets. 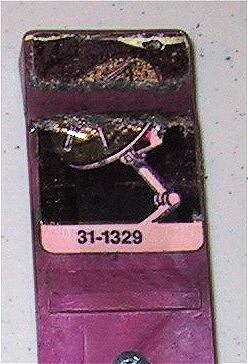 The flippers were also rebuilt, with the proper coils installed. The right flipper had a more powerful coil that caused numerous airballs, replacing it with the proper strength coil vastly improved the play of the game - moral of the story - a stronger coil does not necessarily mean better flippers!